Last night in the UK saw the start of the eleventh series of popular BBC2 car show Top Gear – so it’s time to finally visit the Top Gear studio and track! Based at Dunsfold Park in Surrey, the two mile track was built on an old RAF airfield by Lotus engineers. As seen from the opening credits, the large hanger by the track is the studio, although the large Top Gear logo isn’t there any more (or perhaps this picture was taken before filming). Just next to the studio, you can see the production office of Top Gear, which is, according to the makers, just a portakabin! 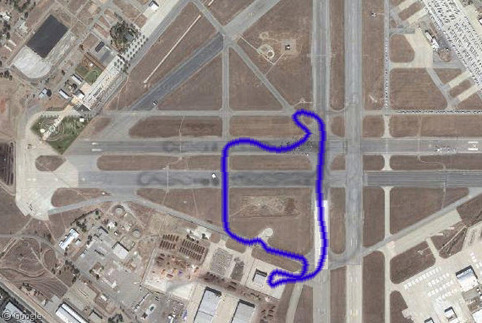 A member at Google Earth Community has posted an overlay of the track, so you can get an aerial overview of Gambon and the follow-through, with the Hammerhead sitting at the end of the runway. The lack of visible tyre marks suggests that the images was captured before the ‘Power Lap’ and ‘Star in a Reasonably Priced Car’ features began. You can find out more about Top Gear and Dunsfold Park at Wikipedia. Sightseeing car fans in the UK can watch the most recent Top Gear again at BBC’s iPlayer. Thanks to Scott Blair, Shane Ferguson, Justin Flavin, Stu Gowdy, Lee, Patrick, Scott and Matt Wix. The photos that GE uses for Dunsfold Park were taken in 2001 but Top Gear was only re-launched (in it’s current format) and started using Dunsfold in 2002. Hence no skid marks, marker lines etc. Love the blog but thought I’d point out that Top Gear has been going much longer than 11 years. It started way back in 1977 and has been running in its current format for about 6 years. Looks like a harrier on the taxi-way. @Jim: Glad you love the site 😀 The previous version of the show was completely different, so it’s fair to call the current series of Top Gear series 11 (fifth gear was more of a continuation of the previous show). I may be wrong but isnt the logo superimposed onto the hangar by computer jiggery pokery? 2 years old? And you have to pay for that? Um, we can get it via torrent or YouTube quite easily. The Top Gear logo up on the roof as seen in the opening credits a superimposed computer image. If you do a slo-mo, you’ll see the logo magically appear from nowhere just before the camera pans up on the roof.